"This tastes just like a Thin Mint® Girl Scout cookie!" 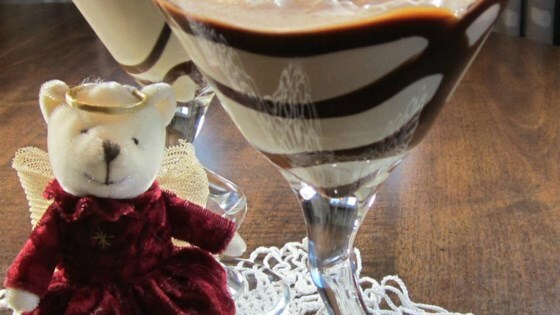 Drizzle chocolate syrup around the inside edge of a martini glass; place glass in the freezer. Fill a cocktail shaker with ice; pour peppermint schnapps, chocolate liqueur, and cream into shaker. Cover, shake, and strain martini into the prepared martini glass. Oh. My. Gosh. This was so stinkin' good. Wow! This is an amazing drink! I used RumpleMinze Peppermint & Naughty Cow Chocolate liqueur! Not only is this yummy, it is also very attractive. We topped it with a dollop of whipped cream to dressed it up even more for a more festive cocktail for Christmas tree decorating.